The only IP addresses on that web page that are relevant for a receive connector those for Exchange online and TCP port 25. These are the IP address for Exchange Online Protection (EOP). To simplify automated configuration, Microsoft also makes these IP addresses available in XML format downloadable directly from Microsoft. You can download this using PowerShell. Once you have downloaded the xml file, you can extract just the IP addresses for Exchange Online Protection. Once you have that list of IP addresses, it's easy to configure a receive connector with that list of addresses. It's rare, but occasionally I run into a need to edit Exchange attributes on user mailboxes manually. 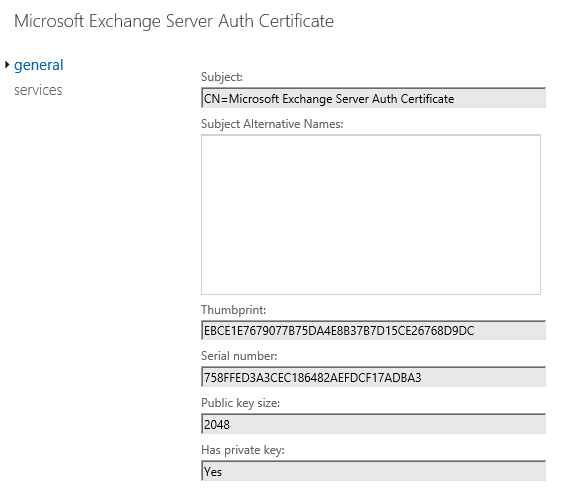 Last week I had a situation where a user account had no Exchange mailbox, but did have some Exchange attributes populated. This left me in a scenario where running Enable-MailUser failed for the user accounts. For some of the accounts, blanking out the HomeMDB attribute was sufficient. 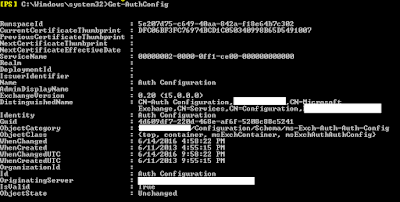 However, for two accounts, even after blanking out HomeMDB it didn't work. When I ran Get-User (the Exchange cmdlet) it reported back that the account was already a MailUser. However, if I ran Get-MailUser I got an error back indicating that: "The operation couldn't be performed because object 'username' couldn't be found on 'servername'". Once those two attributes were cleared, I was able to use Enable-MailUser as expected. I think this is something to do with security permissions, but when I click a link to install the hybrid wizard all I see is a flicker scanning file and then nothing. I tried adding a few site to the trusted sites list. I'm putting the above link in my blog primarily so I remember where it is. I got this link from the following blog post. On my laptop, I run Windows 10 Pro Insider Preview current build 17692.1000. I am guessing that my OneDrive issue was related to that. It seemed to happen after a recent update, but I'm not 100% sure. Attempting to run OneDrive from the Start menu indicated that OneDrive.exe was missing. OneDrive status was blank when viewing files in File Explorer. Failed - because it wasn't even running! However, at this point, in %LocalAppData%\Microsoft\OneDrive, I saw there was a file OneDriveStandaloneUpdater.exe. I tried running that with no fix. I browsed around a bit more and found OneDriveSetup.exe in the %LocalAppData%\Microsoft\OneDrive\Update folder. I ran this file and I got the dialog box indicating that OneDrive was being prepared for first use. When it completed, it kept the settings for both my personal and OneDrive for Business. The only hiccup was that the file I was working on over the last two days was listed as a conflict that I needed to resolve. As much as this annoyed me, I think this shows how much better the OneDrive client is than it used to be. Not that long ago, almost any syncing problem was fixed by resyncing and downloading all of the data again. This properly recognized and retained a few GB of data only having an issue with the file that was modified while OneDrive wasn't running. That's pretty good. 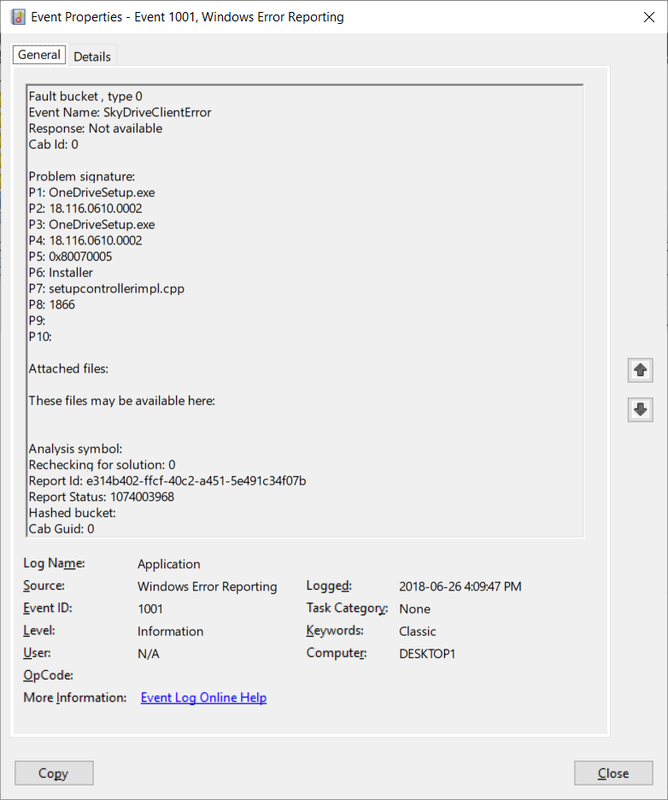 Well this happened again, and I found an event log error that looks like the setup file for OneDrive was trying to run and failed. I was able to find this error for today and the previous event where it failed. Both were event ID 1001 which is pretty generic. The P5 value was different on the previous error. 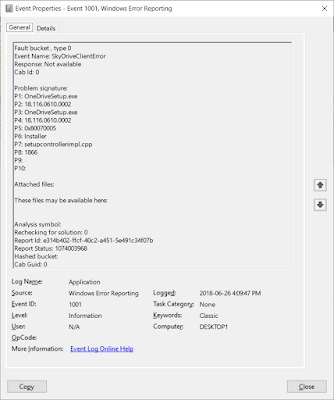 I was able to confirm that running OneDriveSetup.exe alone was enough to fix the issue. As of build 1709 (that is September 2017), Windows Server 2016 does not support using FRS (File Replication Service) for the replication of SYSVOL data on domain controllers. Some of you are saying: "Man, that's old. Who uses that anymore?" Well, anyone that never bothered to update which is probably most small and even mid-sized businesses who have been updating to a new OS version over the years, but didn't realize they had a choice for SYSVOL replication. 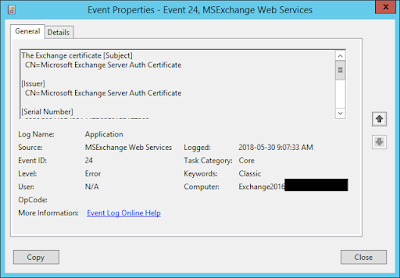 When you install your first Exchange Server 2013 or Exchange Server 2016 server, a certificate with the friendly name Microsoft Exchange Server Auth Certificate is created. This certificate is self-signed and used for OAuth authentication between applications such as Exchange Server and SharePoint. 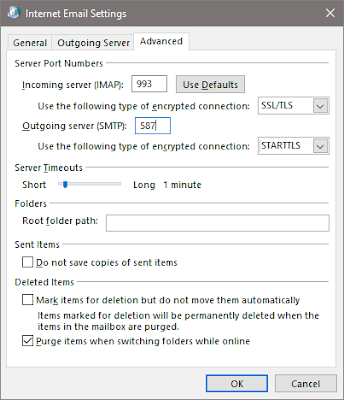 However, it is also used for hybrid deployments between on-premises Exchange Server and Exchange Online. This certificate is unique because it is installed on all of your Exchange servers. The subject for the certificate is "CN=Microsoft Exchange Server Auth Certificate" and does not contain any SAN names with references to specific servers. It also has a 5-year lifetime. Which is just long enough for everyone to forget about it. I suspect that this certificate is due to expire in many organizations soon. expired on 2018-05-16 6:25:31 PM. 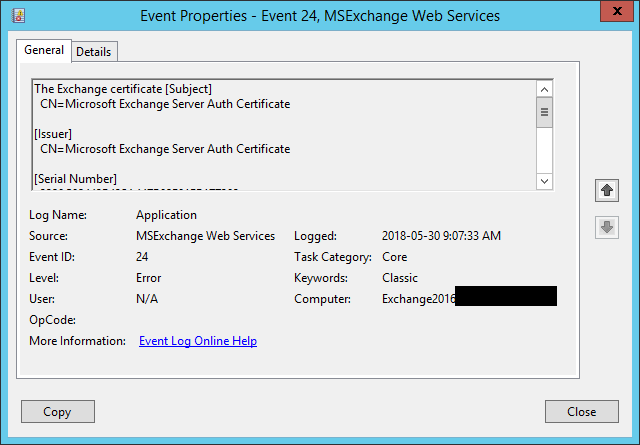 This certificate is not bound to IIS, so why is this expiration being noted by MSExchange Web Services? 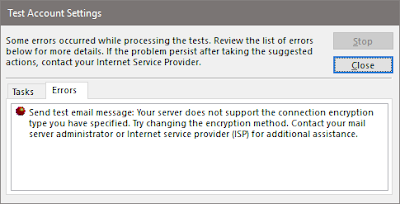 The certificate used for authorization is set separately from IIS but is configurable. 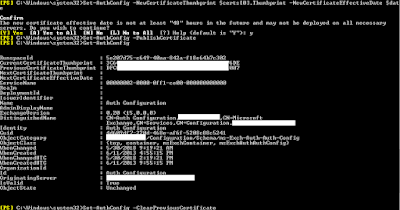 You can see the currently configured certificate by using Get-AuthConfig. The thumbprint for the certificate is listed in the CurrentCertificateThumbprint property. If you've already been searching around related to this certificate, you've probably found some instructions on how to recreate it. However, if it is expired, you can just renew it instead by using the Exchange Admin Console. 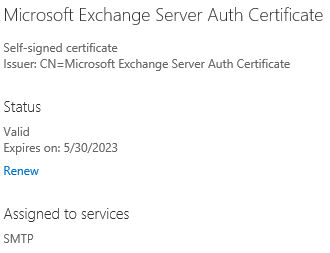 In servers > certificates, select Microsoft Exchange Server Auth Certificate and then click Renew in the details pane as shown below. The screen shot below is of a certificate that is not expired yet, it looks exactly the same other than the expiry date. 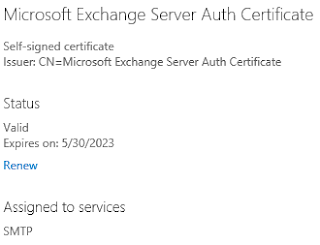 Renewing creates a second certificate named Microsoft Exchange Server Auth Certificate that is valid for another 5 years. This certificate has a new thumbprint and exists only on the server you've renewed it on. You need to identify the thumbprint for the new certificate. 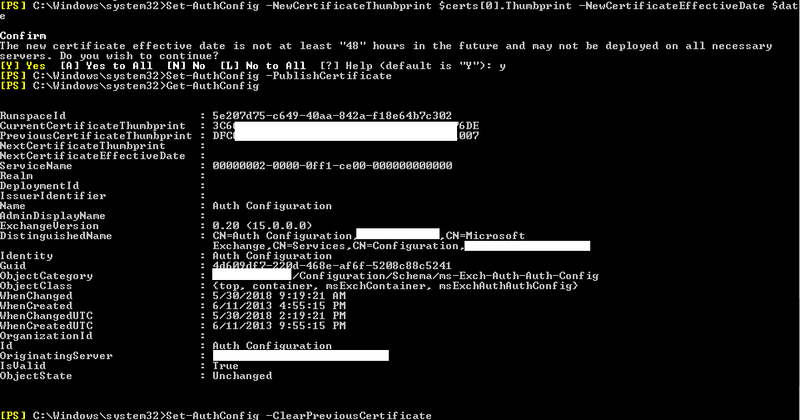 If you edit the certificate, in Exchange Admin Center, the thumbprint is on the general tab as shown below. You can type this in, but you're probably better of to cut and paste it into the later commands. My preference is to put the required information for the next command into variable. We need the thumbprint of the new certificate and the current date. You will get a warning that the new effective date is not 48 hours in the future. However, if we're recovering from an expired certificate, we're OK with that. Finally, since we've removed all references to the expired certificate you can delete it from all Exchange servers. 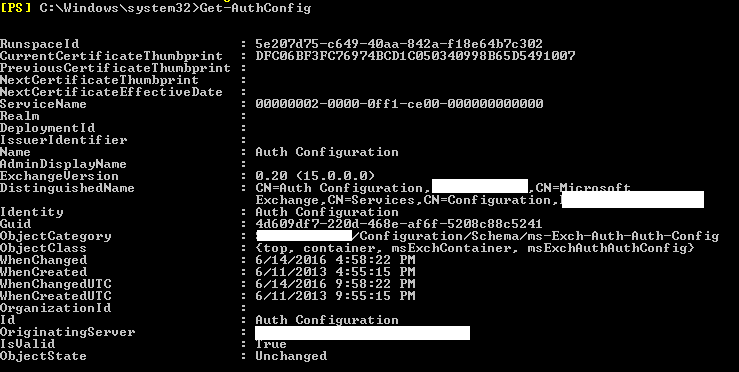 You may find that you need to do an iisreset after all of the AuthConfig changes were done. I found some examples where they ran iisreset.exe and didn't take the time to experiment. It's possible that it will pickup without a restart but just take longer.